Did you know that Skype has a share button? 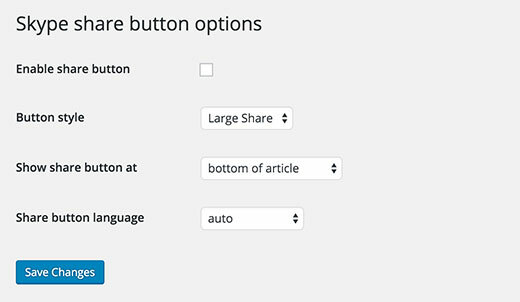 We didn’t either until a reader asked us for a tutorial on how to add the Skype share button in WordPress. Skype is one of the most popular communication apps in the world. In this article, we will show you how to easily add a Skype share button in WordPress. First thing you need to do is install and activate Skype share plugin (see our beginner’s guide on how to install a WordPress plugin). Upon activation, go to Settings » Skype share button page to configure the plugin. The first option is to enable the share button. You must check this box to enable the Skype share button on your WordPress site. Next, you need to choose a button size. Available sizes for the button are large share, small share, circle icon, and square icon. Lastly, you need to choose the location of the button. You can either choose to show it on top of the article, below the article, or both. Skype share can automatically detect the language of your WordPress site. But if it doesn’t, then you can manually select the language. That’s all, you can now visit your website to see the Skype Share button in action. If you want to manually add this in your theme files, then you can follow the manual code instructions below. First add the following script in the head section of your file. You can either do this by directly editing your header.php file or do it the proper way of adding scripts by using Enqueue scripts. After that add the following code in your single.php, loop.php, index.php, page.php, category.php, and archive.php as long as it is placed within the post loop. You can change the data-style to large, small, circle, or square. You can also change the language to your desire language. Basically, the code above will allow the user to share the individual post with the post title as the message. Thanks for sharing this great article. Now i can manage my Skype account. I did not know you could put a Skype share button on a WordPress blog. That is interesting and nice to know. If you are using Skype as an integral part of your promotion for your blog it would be great to be able to have readers share posts on Skype. Nice tutorial on how to install the button. Really clear and easy to understand.